Mankind’s consumption of cannabis in the form of both hemp and marijuana has been around for millennia. Shown to improve overall health and wellness, non-psychoactive CBD-infused hemp oil is now resurfacing with its vast possibilities in treatment applications. Derived from the hemp plant, cannabidiol (CBD) is one of over 80 cannabinoid extracts and is non-psychoactive, meaning it cannot produce a “high.” It is a natural, plant-based compound that is non-toxic to humans and animals. As one of the active constituents of the hemp plant, CBD has a profound healing and balancing effect on all mammals — including cats and dogs. CBDPure is legal and safe for human consumption. Why CBDPure for Pain & Anxiety Treatment? CBDPure oil extract delivers the most powerful and effective benefits because it contains naturally occurring cannabidiol, terpenes and other cannabinoids. 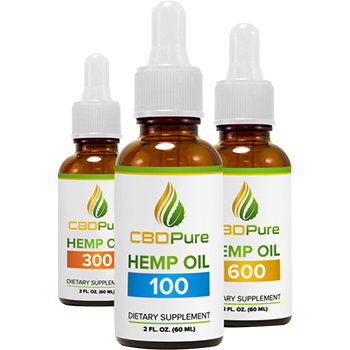 Available in 100 mg, 300 mg, and 600 mg bottles, as well as easy to swallow softgels, natural and organic hemp oil extract from CBDPure delivers 3.3 mg, 10 mg, 20 mg, and 25 mg daily servings of cannabidiol respectively. CBDPure is unique because it is made using certified organic-standard industrial hemp grown in Colorado and is 100% free of any synthetic or artificial ingredients. Hemp oil from industrial hemp is currently legal to ship within the United States. CBDPure also uses a chemical-free CO2 extraction process that applies pressurized carbon dioxide to pull the desired phytochemicals (such as CBD) from a plant. This process is free of any harsh chemical solvents often used to extract CBD oil. CO2 extraction is environmentally friendly and non-toxic. It is also considered the most expensive and safest plant extraction method in the world. The highest grade product on the market. Every bottle has been quality tested by an independent third-party lab to make sure you’re receiving the best CBD oil possible. CBDPure contains a full spectrum of cannabinoid and terpenes, which studies have shown provide a better overall therapeutic effect on animals than CBD alone. Made with 100% certified organic hemp grown in Colorado. CBDPure never compromises on quality, and only contains the finest and purest CBD oil on Earth. The sublingual delivery system is quick and easy. Simply administer a dosage of CBDPure under the tongue and the oil is absorbed directly into the blood vessels for rapid absorption. CBDPure believes their oil is the highest quality product available, which is why they back all bottles with an unconditional 90 day money-back guarantee. Customers worldwide swear by the proven results that CBDPure delivers. See for yourself what CBD oil can do for you or your loved one’s overall health and well-being. Looking for safe, effective, and legal CBD oil for sale for you or a loved one?